Have you been experiencing issues with Drawboard PDF since the Windows 10 Anniversary Update? Click here for help. This legacy website is not maintained. The top paid Windows PDF app to read, annotate and mark up your PDFs. Whether you're at the office, on the road or at home, stop printing and scanning! With Drawboard PDF, annotation is finally as easy as it should be. Welcome to getting things done. What are you waiting for? Save yourself time and money by not printing, scanning and waiting. Designed for Windows tablets, Drawboard goes where you go. With large-scale deployment available, you're ready to roll out. Drawboard fits within your existing markup processes. Our focus: the best markup and annotation experience. Stat. The top paid Windows PDF app to read, annotate and mark up your PDFs. Ideal for replacing pen and paper - avoid having to print documents ever again, making annotating PDFs a breeze. Open existing PDFs, create a new PDF, annotate using an extensive array of tools, and save back as a compatible PDF. Whether you're on the road, in the office or at home, Drawboard PDF makes your annotation workflow the best its ever been. The Drawboard team is always working on new features and improvements, and so as we create them, you get them. Whether you're in normal mode or using Pressure Sensitive Ink, Drawboard has the best inking experience of any app on the Windows Store. Underline, strikeout, squiggly and highlight your text PDFs. Easily fill out digital forms. Save these within Drawboard, flatten your signature, and send to others using share functionality. Pin your files to the Drawboard PDF home screen, or even your start screen. With our intuitive home screen for finding files, as well as the Drawboard radial menu, your annotation experience will never have been as easy. Insert bookmarks and view your markup history to keep track of who did what, when, and where you're up to. With an ever-increasing agency structure of getting work done, Drawboard makes inter-team annotation workflow the best it can be. Microsoft Surface Book, Surface Pro 4 and Surface 3. Are you planning on purchasing a Microsoft Surface Book, Microsoft Surface Pro 4 or Surface 3? Fear not! 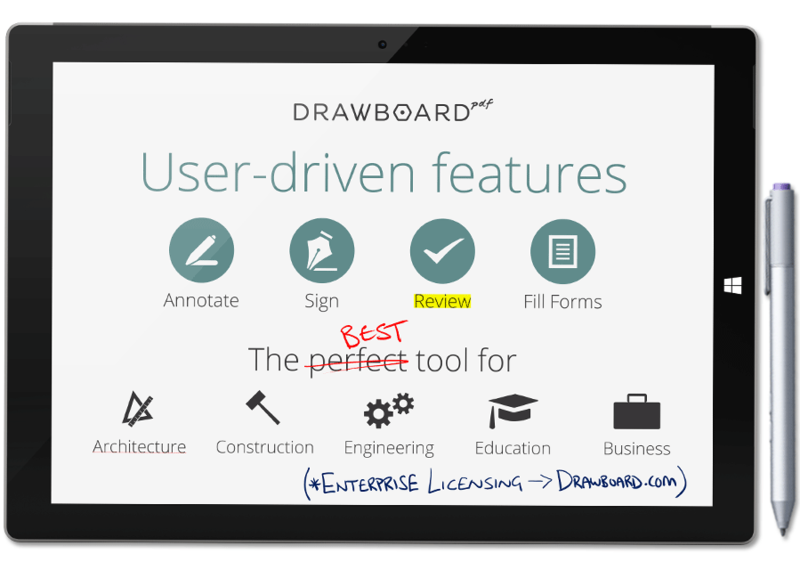 Your device comes with Drawboard PDF - free. Drawboard has a strong focus on the AEC industries, and more features to enhance your experience are on their way. Drawboard is working to streamline your workflow by providing an efficient means to redline drawings and other documents. For more information, get in touch. Are you looking for a high-volume manner in which to deploy Drawboard PDF? I love this app. I have been able to get our field team to use for as-build's and engineering questions on drawings without having to leave job sites. I woukd have paid much more for the great value and money it saves us. I use this app everyday for reviewing documents, reading code documents and replying to submittals and RFIs. I would recommend this for anyone in the architectural or engineering industry. Most of my time is spent managing projects remotely. This app allows my staff to send me their ideas, pictures of installation issues, and even documentation. I can mark it up and return within minutes. Want to stay in the loop on what Drawboard is up to? Enter your email and we'll be in touch! We won't send you holiday snaps, we promise.